Depending on which Michael’s House campus you are attending (the Stabilization Center, Michael’s House Treatment Center, Outpatient Center and Men’s Transitional Living-Coming Soon! ), you will be able to experience different types of groups and activities. The treatment program at Michael’s House is based on the award-winning system of care developed by its parent company, Foundations Recovery Network. 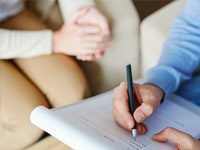 It is designed to integrate care for both substance abuse and mental health conditions in a comprehensive way that allows for long-term healing and recovery. We support patients with an integrated, multi-disciplinary team. Primary therapists, consulting physicians, residential therapists, nurses, group leaders and others are all part of a patient’s treatment team. This team meets weekly to discuss the progress of each patient and to plan for his or her stability and recovery. The Men’s Program at Michael’s House focuses on the unique strengths of each individual not just to help establish life goals, but also to inform the path to recovery. Here, men will learn how to process and problem solve, recognize positive and negative patterns, build character and find balance along the way. By facilitating a healthy environment, the experienced staff in the Men’s Program helps patients find stability and build an arsenal of coping skills to help them overcome the life challenges ahead for long-term recovery. The Women’s Program at Michael’s House empowers patients to create and reach life goals. By discovering each woman’s individual strengths, patients learn new and healthy ways to set boundaries, problem solve, reinforce positive mindsets and find balance. The integrative team of experts in the Women’s Program is devoted to the well-being of each individual, consistently collaborating to discuss progress and the best options for hope and healing. At Michael’s House, we offer support and understanding for LGBT individuals seeking recovery. We understand that different populations have different needs, and to meet those unique needs we offer integrated treatment with gender-specific programs for both men and women. The goal isn’t to separate – participants are still part of the larger population – but to provide a safe place to address both the external and internalized oppression that can often present barriers to an LGBT individual’s recovery from addiction and mental health issues. Michael’s House staff is committed to provide patients with a variety of tools, experiences and knowledge related to substance abuse and mental health recovery. Providing a three-day intensive family program is one way for families, partners and loved ones to share in this experience. This program enables families and supportive others to begin or continue in the healing process through validation, education, and support. Adventure therapy offers patients the opportunity to develop important life skills by exploring personal issues beyond the walls of the treatment center in a safe, supportive environment under the guidance and support of trained mental health professionals and certified Wilderness First Responders. Activities may include hiking, rock climbing, zip lining and cooperative teambuilding games. At Michael’s House, adventure therapy is an integrated piece of each patient’s daily routine. Heroes in Recovery is a grassroots movement ignited by Foundations Recovery Network and the widespread community of those who are in recovery from addiction and co-occurring disorders. While around 23 million people each year need help for addiction, only 3 million actually receive treatment. This is often due to the overwhelming stigma that exists around acknowledging substance abuse and mental health issues. The L+C is a positive and motivational community filled with go-getters like you, ready to tackle their next steps and cheer for others as they do the same. Whether your challenge is getting out of bed in the morning, reconnecting with a loved one or making strides towards a personal goal, we are here to help you see it through.